Encounters with the ocean's friendliest residents are waiting at Moorea Dolphin Center at the Intercontinental Resort & Spa Moorea. Here, adults swim side by side with dolphins, while children wade in the waters with them. Learn dolphin training techniques, and participate in the daily care of these amazing animals. How many pounds of fish can a dolphin eat? Who are these mammals so close to us by their intelligence? Do they understand us? How do they breathe? Trainers will tell you all you've ever wanted to know about the Atlantic Bottlenose dolphins anatomy, behavior and habits. Equipped with a life vest and a mask you will then take the relationship one step further by joining your new friends in their element. Their impressive jumps and flips are fascinating to observe. Dolphins are great acrobats and water ballet dancers. These mischievous and teasing mammals like to play tricks on their visitors...but all is soon forgotten...time for a (wet) kiss! 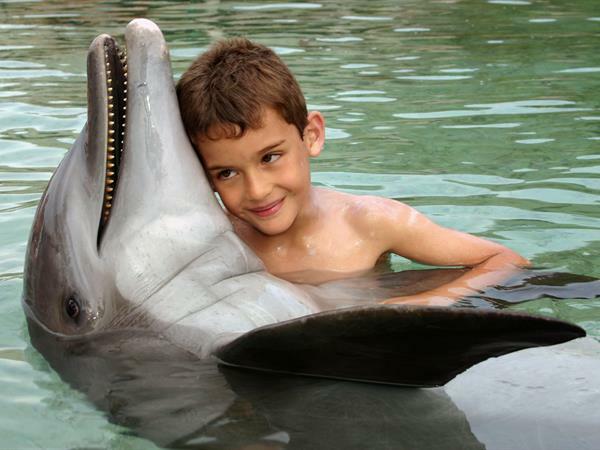 This dolphin encounter combines elements of hands-on contact, education, fun, laughter and adventure. Meet these amazing dolphins and enjoy their grace and agility in the safety of shallow water. A professional photographer is present during each session. Personal cameras and videos are not authorized in water during the interaction with the dolphins, in order not to disturb the animals. Includes 15 minutes educational instruction and 15 minutes in the water with a dolphin. This program is meant for Guests 10 YEARS AND OLDER that are good swimmers and know how to use a face mask and a snorkel. During the first part of this program, we'll teach you about marine mammals (whales, dolphins, porpoises, etc. ), their anatomy, habits and behaviors. Then accompanied by a trainer, you will join the dolphin in deep water, play with him and observe him underwater. While touching and kissing him, you will share and amazing moment on his side, learning how to protect them and preserve their fragile environment. Includes 15 minutes of educational instruction and 15 minutes of interaction in the water with the dolphin. This program is meant for Guests 14 YEARS AND OLDER that are good swimmers and know how to use a face mask and a snorkel. During the first part of this program, we'll teach you about marine mammals (whales, dolphins, porpoises, etc. ), their anatomy, habits and behaviors. Then accompanied by a trainer, you will join the dolphin in deep water, play with him and observe him underwater. Then hold on! 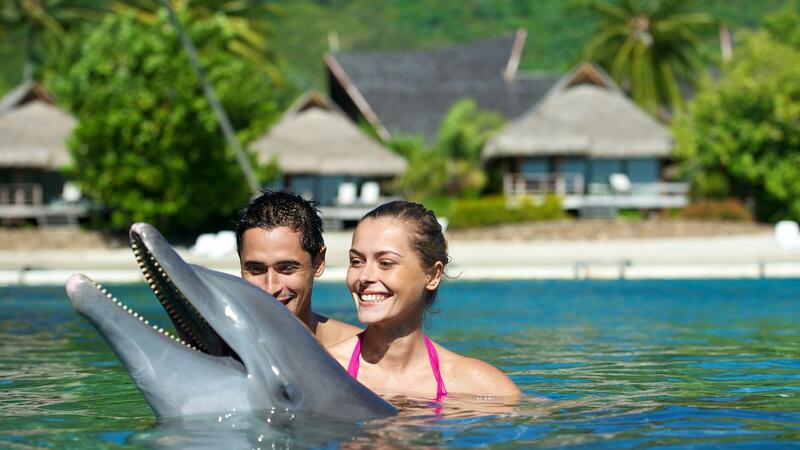 You will hold on to the dolphin's fins and dive with him for a thrilling ride and unforgettable moment. You will learn how to protect them and preserve their fragile environment. Includes 10 minutes of educational instruction and 30 minutes of interaction in the water with the dolphin.